This article was written by our own Jaret Landon and published in the June 2015 issue of Reformed Worship (reformedworship.org). Used by permission from the author. Pullman Christian Reformed Church's diversity in our worship service is contributed to the efforts of our membership, staff, and a commitment to meet the needs of the community in which we reside. Located in the neighborhood of Roseland, PCRC is in the heart of an area where 97% of the residents are African American. We maintain an awareness that in order for diversity to be successful, the dominant culture (Dutch-based) cannot demand or assume control. A dual enrichment is fostered because we respect and enjoy each other's worship and music styles. The material chosen for our liturgy includes the full spectrum of Gospel Music, Reformed Hymns, and Contemporary Christian Music. The participation of our membership in embracing diversity allows for a beautiful multi cultural worship experience. We maintain an awareness that in order for diversity to be successful, the dominant culture cannot demand or assume control. ethnic and racial backgrounds. Hardships came in the 1960s when industry patterns lead to an economic decline and a rapid ethnic succession. For over forty years, Roseland has endeavoured to recover from a weakening economy and gang violence. Community leaders and residents have come together to bring about much needed change. Born out of the turbulent racial tensions in Roseland (and surrounding areas) of the 1970's, Pullman CRC was established as a place to practice a ministry of reconciliation whose fruits may be witnessed in diverse membership (approximately 70% African American and 30% Caucasian). The diversity of membership created a foundation for diversity in worship. For 21 years, Helen Breems was the Director of Music for PCRC, until retiring in 2011. With a vast knowledge in the music of the Christian Reformed faith and somewhat unfamiliar with teaching Gospel Music, she committed to learning the structure and nuances of the genre to ensure diversity in our worship experience. Music resources such as CDs and Sheet Music were purchased to aid in studying this style of music. Once learned, she taught the material to the choir, song-leading teams, and ensembles, which were a large representation of our congregation. This allowed an easy transition for the material to become congregational songs. Countless hours were given to transcribe music, making it accessible to our congregation and easily incorporated in our worship service. Her steadfast commitment of studying music rooted in the African American experience helped Pullman to grow, continually. Helen was also willing and eager to share the platform/step aside when I became a part of the music staff. With the two cultures working together for many years, both have been enriched by each other; both leadership and the congregation have become more reformed and we've learned to appreciate the richness of gospel music, using qualified people to give us the genuine aspects of all facets of Christian Music. 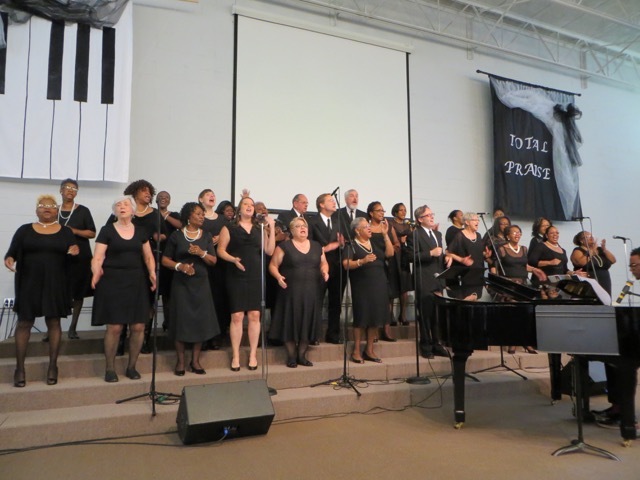 For over thirty years PCRC has committed financial resources to hiring musicians, specifically keyboard players, who could perform various styles. In most genres of music, the keyboard or piano serves as the foundation of sound. Hiring a musician who could play various styles of Christian Music was a crucial part of our success, as is today. Without the talent of skilled musicians, achieving a multi-cultural worship experience would have been very difficult. Skilled minstrels have played a intricate roll in liturgical activities for centuries and Pullman remains committed to compensating skilled talent to enhance worship participation. Also, in our congregation, we have talented musicians who donate their time and gifts on a weekly basis. Personnel includes a percussionist, guitarist, bass guitarist, and two trumpet players; all bringing various experiences, strengths, and years of playing their respective instruments. The ages of the musicians vary from teen to mature adults. This collaboration of talents not only creates wonderful musical moments, it displays God's blessings among all of His people.